WALL-E is the delightful computer animated movie about a robot who finds love that not only ends up "saving" the world but also gets his robotic girlfriend in the process. 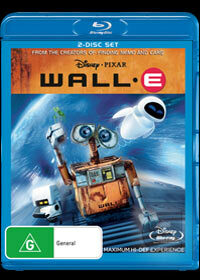 Beautifully created by Pixar, the animation behind WALL-E is quite awe-inspiring and although this review covers both the DVD and Blu-ray version, the former is truly jaw dropping. The best part of WALL-E is that it can be watched by children of ALL ages, whether it's 5-year olds or 50-year olds as the story behind this loveable little robot is quite immersive and at times quite emotional for a non-animate creature. The story of course revolves around WALL-E who has been given the task of removing the rubbish from Earth after mankind has decimated the planet. Unfortunately for WALL-E, his colleagues have long since been deactivated but fortunately for WALL-E, he is still operating and has somehow managed to gain sentience. As WALL-E spends his days cleaning the planet, he has grown a passion for collecting items and also became a fan old movies, especially the movie "Hello Dolly" which he simply adores. His life soon changes when he encounters another "robot" called EVE who has been sent by the remnants of mankind to see whether life has started again on the planet. When WALL-E falls head over heels for EVE, things go astray when EVE discovers a plant and her main programming kicks in of collecting specimens and returning them to the huge space station where mankind now resides. WALL-E tags along for the ride as he uncovers a conspiracy by the space station's main computer which has caused huge issues for man itself. Without spoiling the movie, WALL-E features action, drama and romance plus a healthy dose of comedy as our little robot attempts to achieve the unthinkable in this classic feel good Pixar film. Although the both DVD and Blu-ray version of WALL-E are presented in an aspect ratio of 16:9 widescreen, the quality on both presentations is truly outstanding. The video quality on the DVD is exceptionally sharp with vibrant colours that truly showcases the animation. However on the Blu-ray version, the video quality supports 1080p HD Widescreen which is crystal clear and is easily a reference disc in terms of the stunning video quality. The DVD supports Dolby Digital 5.1 which sounds brilliant as does the Blu-ray version which boasts enhanced Blu-ray sound. Needless to say both the DVD and Blu-ray versions are a truly impressive production with no complaints at all from this reviewer. When it comes to special features, the DVD and Blu-ray versions share the BURN-E featurette, Presto, Deleted Scenes and audio commentary to give you a true behind the scenes feel to this extraordinary movie. The BURN-E feature is a great animated short about one of the robots from the film that is a great little comedy featurette. Presto is another animated short that is a cute cartoon about a magician and his "rabbit". Of course, there is the standard audio commentary which is actually quite interesting and at times amusing. The Blu-ray version really shines when it comes to the extras such as the Pixar Story by Lesie Iwerks that is a great history about Pixar and the movies they have made. Add in some deleted scenes, a behind the scenes documentary and the educational "Bot Files" which kids will adore and the Blu-ray version is truly an outstanding collection. In conclusion, WALL-E is a great movie that is clichéd, comedic and sometimes predictable, however the journey is what it's all about and it's a truly enjoyable ride. You also need to appreciate the amazing animation behind this film that is at times quite realistic and really assists in drawing you into this great story about a robot looking for love. Even on standard definition, the video quality and audio quality is amazing on DVD, however on Blu-ray...wow... it's truly out of this world. Perfectly directed by Andrew Stanton that stars Ben Burtt, Elisa Knight and Sigourney Weaver, Pixar and Walt Disney have created the almost perfect film!